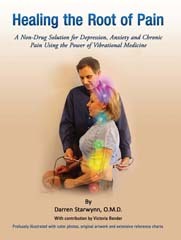 Healing the Root of Pain book by Darren Starwynn, O.M.D. This is Dr. Starwynn’s new book about his PNE Balancing system for treatment of depression, anxiety, PTSD, chronic pain and other mind-body disorders. Covers principles and techniques for use of color light, microcurrent, therapeutic sound, essential oils, acupuncture, auricular therapy, intuitive counseling and soul healing methods for effectively addressing these issues. 246 pages, includes new color artwork and profuse photos, diagrams and reference charts. For more information, CLICK HERE to read Back Cover. 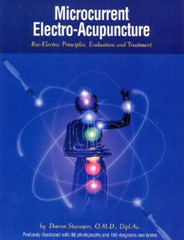 Microcurrent Electro-Acupuncture (MEA). Bio-electric principles, evaluation and treatment. (Paperback) By: Darren Starwynn, O.M.D.,Dipl.Ac. The definitive reference text is finally here! Are you ready to enhance your clinical results through the powerful principles and techniques of electromedicine? This book is the definitive guide to this new and outstanding modality. It is organized into easy-to-reference sections covering all aspects of theory, technique and treatment plans. Abundant photographs illustrate all techniques and listed acu-points. Once you start using microcurrents in your practice, you will refer to this text again and again.